Texas leads the nation in oil and natural gas reserves and production. In just 2-1/2 years, Texas has doubled its oil production with large quantities coming from the Eagle Ford Shale formation. A recent new shale oil find at the Wolfcamp Shale formation is expected to be the largest oil field in the United States and the second largest field in the world. Half of Texas’s electricity is generated from natural gas and over 32 percent of the state’s electricity is generated from coal, most of which is imported from Wyoming. Texas also uses the coal it mines within the state, which is predominately lignite coal. Texas has the largest wind capacity in the United States and generates over 7 percent of its power from wind. Two nuclear power plants, Comanche Peak and South Texas Project account for about 9 percent of the state’s electricity generation. Due to its large population and an energy-intensive economy, Texas leads the nation in energy consumption, accounting for more than one-tenth of total U.S. energy use. The industrial sector accounts for 50 percent of the state’s energy consumption. Energy-intensive industries in Texas include aluminum, chemicals, forest products, glass, and petroleum refining. Texas leads the nation in natural gas reserves, accounting for 29 percent of the U.S. total natural gas reserves at the end of 2011. Deposits of natural gas are found in abundance in several Texas production basins, with the largest fields heavily concentrated in the East Texas Basin in the northeastern part of the state. Texas is the nation’s leading natural gas producer, accounting for 29 percent of total U.S. natural gas production in 2012. Texas is also the leading producer of shale gas in the United States, producing 36 percent of the U.S. total in 2011. In the early days of Texas oil production, natural gas found with oil was often flared at the wellhead. While some areas located near the oil fields used some of the natural gas for energy, it was not until the State banned flaring after World War II that oil producers found new markets for natural gas. Two pipelines that once carried crude oil to the East Coast were converted to carry natural gas and a new natural gas pipeline was built carrying natural gas to California. These events spurred the strong natural gas production growth that began in the 1950s and 60s. Texas natural gas production reached its peak in 1972 at more than 8.6 trillion cubic feet of annual production. Natural gas production in Texas then began to decline steadily to less than three-fifths of that level by 2005, but has subsequently increased to over four-fifths of the 1972 peak production level. Now, a large network of interstate natural gas pipelines extends from Texas, reaching consumption markets from coast to coast, including those in California, the Midwest, the East Coast, and New England. Natural gas is also supplied to Texas via pipelines from New Mexico, Oklahoma, and Mexico. Texas has 7 natural gas market hubs located in both East and West Texas, more than any other state. Texas also has the largest natural gas storage capacity in the nation–34 active facilities–the majority of which were converted to storage facilities from depleted oil and gas fields; the others were developed in salt dome formations. These facilities allow Texas to store its natural gas production during the summer when national demand is typically lower and to ramp up delivery quickly during the winter months when markets require greater volumes of natural gas to meet home heating needs throughout the country. Besides supplying other states with natural gas, Texas has received approval for a liquefied natural gas (LNG) export terminal, which will supply foreign countries that do not have a free-trade agreement with the United States with natural gas. The Freeport LNG project in Texas received approval from the U.S. Department of Energy in June to add liquefaction processing to its existing facility that is expected to produce 2 billion cubic feet per day of natural gas for export. It is a $10 billion facility that is 50 percent owned by ConocoPhillips. Other LNG export terminal applications for facilities in Texas are pending approval from the U.S. government. 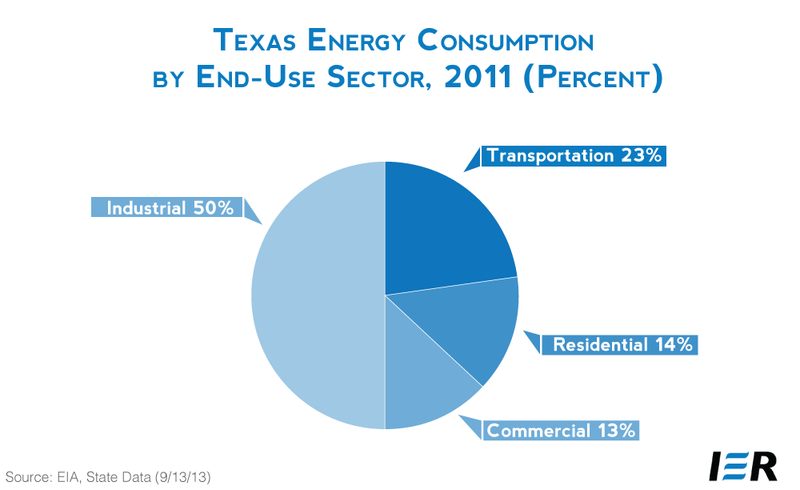 Texas consumes more natural gas than any other state and accounts for 14 percent of total U.S. natural gas consumption. Texas natural gas demand is dominated by the industrial and electric power sectors, which together account for 70 percent of the state’s consumption. Thirty-seven percent of the state’s households heat their homes with natural gas. Texas leads the nation in oil reserves with 26 percent of the U.S. total as of December 31, 2011. 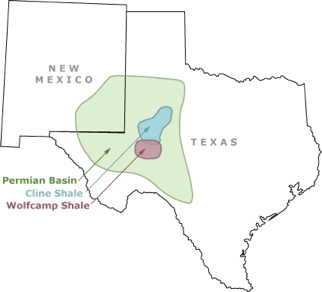 Texas’s oil reserves are found in several geologic basins throughout the state with the largest reserves concentrated in the Permian Basin of West Texas, which contains more than 20 of the nation’s top 100 oil fields. Texas leads the United States in both crude oil production (31 percent of total U.S. production in 2012) and refining capacity (27.5 percent of U.S. total refinery capacity in 2012). The state’s first major oil boom began in 1901 with the discovery of the Spindle Top oil field in the upper Gulf Coast basin. Major discoveries have been made in East Texas, West Texas, and offshore in the Gulf of Mexico. Texas oil production increased until 1972, when it peaked at more than 3.4 million barrels per day. Afterward, production declined rapidly, bottoming out in the late 2000’s, and in recent years Texas crude oil output has increased to about two-thirds of its 1972 peak. In only 2-1/2 years, Texas doubled its crude output, reversing a 23-year decline. The recent increases in oil production are primarily attributable to oil production in the Eagle Ford Shale formation, a sedimentary rock formation, where hydraulic fracturing and directional drilling are used to obtain the oil. The Eagle Ford shale formation is a 400-mile-long, 50-mile-wide, crescent-shaped field in the south central part of Texas. According to the Texas Railroad Commission, its production in March rose 77 percent from a year earlier to 529,900 barrels per day. 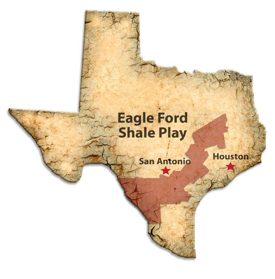 In 2011, Eagle Ford supported 38,000 full-time jobs, generated $10.8 billion in gross regional product and poured millions into state and local tax coffers, according to a report by the University of Texas, San Antonio. If Texas were to be considered as a separate oil-producing country, Texas would have been the 11th largest oil-producing nation in the world for crude oil output in April, slightly less than Mexico, who ranked 10th producing 2.56 million barrels per day to Texas’ 2.465 million barrels per day. Some predict that Texas oil production will likely surpass 3 million barrels per day by the end of this year, possibly surpassing Kuwait, Mexico, UAE, and Iraq to rank as the 8th largest oil-producing “nation” in the world. Texas’s signature crude oil known as West Texas Intermediate (WTI) is the major benchmark of crude oil in the Americas. Because of its light consistency and low-sulfur content, the quality of WTI is considered to be high and it yields a large fraction of gasoline when refined. WTI crude oil is refined at Midwest refining centers, where it is delivered by pipeline, and at refineries in the Gulf Coast region. Texas’s 27 petroleum refineries can process more than 4.7 million barrels of crude oil per day, accounting for more than one-fourth of total U.S. refining capacity. Most of the State’s refineries are located near major ports along the Gulf Coast, including Houston, Port Arthur, and Corpus Christi. These coastal refineries have access to local Texas production, foreign imports, and oil produced offshore in the Gulf of Mexico, and to the U.S. Government’s Strategic Petroleum Reserve, which operates two large storage facilities in Bryan Mound and Big Hill, Texas. Many of Texas’s refineries are sophisticated facilities that use additional refining processes beyond simple distillation to yield a larger quantity of lighter, higher-value products, such as gasoline. Texas refineries also process a wide variety of crude oil types from aboard, including heavier, lower-value varieties. Refineries in the Houston area, including the country’s largest refinery in Baytown, comprise the largest refining center in the United States. Petroleum products from Texas reach virtually every major consumption market east of the Rocky Mountains via refined product pipelines that originate in the Houston area, spanning markets across the country. This network includes the Colonial Pipeline system, which is the largest petroleum product pipeline system in the United States and which supplies markets throughout the South and East Coast. Texas has substantial deposits of lignite coal, found in narrow bands in the Gulf Coast region, and bituminous coal, found in north central and southwestern Texas. In 2011, Texas held 4 percent of total U.S. recoverable coal at producing mines. Although Texas produces a substantial amount of coal from its 11 surface mines, including five of the 50 largest in the United States, Texas imports subbituminous coal by rail from Wyoming for the majority of its supply. Nearly all of the coal mined in Texas is lignite, the lowest grade of coal, and all of it is consumed in the state, mostly by utility companies that operate both the mine and an adjacent coal-fired power plant. Although lower in energy content than other varieties of coal, lignite coal is also low in sulfur. Texas consumes more coal than any other state. Natural gas-fired power plants account for one-half of the electricity produced in Texas and coal-fired plants account for 32 percent of the remaining generation. Nuclear power supplies 9 percent of the state’s generation from two nuclear plants, Comanche Peak and South Texas Project. The two South Texas Project nuclear reactors are the second largest reactors in the nation after the Palo Verde reactors in Arizona. Texas is rich in renewable energy potential, including wind, solar, and biomass resources. Wind resource areas in the Texas Panhandle, along the Gulf Coast south of Galveston, and in the mountain passes and ridge tops of the Trans-Pecos offer Texas some of the largest wind power potential in the United States. Texas leads the nation in wind-powered generation capacity, with 12,214 megawatts of wind generating capacity; it is the first state to have over 10,000 megawatts of wind capacity. It became the country’s largest wind energy producer in 2006 when it surpassed California. Wind currently generates over 7 percent of the state’s electricity. Solar power potential in Texas is also among the highest in the nation, with high levels of direct solar radiation suitable to support large-scale solar power plants concentrated in West Texas. In 2012, solar power generated only 0.03 percent of the state’s electricity. Due to its large agricultural and forestry sectors, Texas has an abundance of biomass energy resources. In 2012, biomass generated 0.4 percent of the state’s total electricity generation. Although Texas is not a major hydroelectric power state, substantial untapped potential exists in several river basins, including the Colorado River of Texas and the Lower Red. In 2012, hydroelectric power generated 0.1 percent of the state’s electricity. 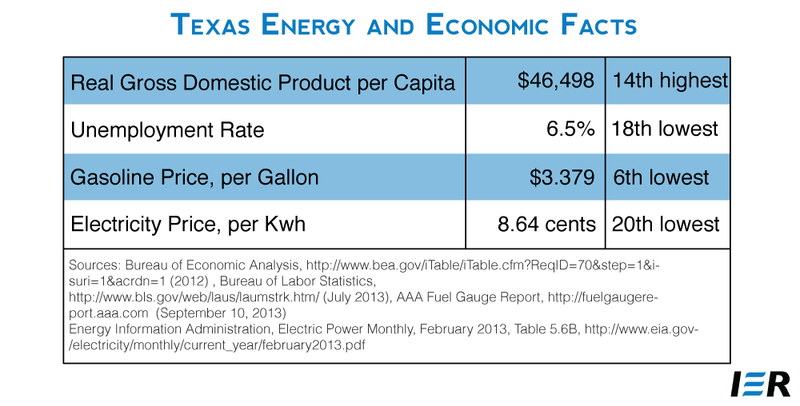 Texas produces and consumes more electricity than any other state. 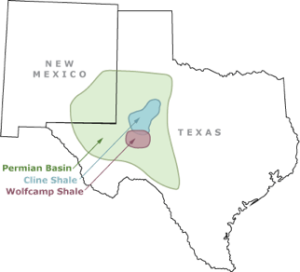 The Texas Interconnect power grid is largely isolated from the integrated power systems serving the eastern and western United States. Per capita residential use of electricity in Texas is significantly higher than the national average due to high demand for electric air-conditioning during the summer months and the use of electricity as the primary energy source for home heating during the winter months. Fifty-eight percent of Texas households heat their homes with electricity. In August 2005, Texas adopted a law requiring 5,880 megawatts of new renewable generation be built by 2015, representing about 5 percent of the State’s total 2005 electricity demand, and requiring 500 megawatts from non-wind generation sources. The new law also set a target for 10,000 megawatts of renewable generation by 2025–a requirement that Texas has already exceeded. Below are some facts about Texas’s regulatory environment that are likely to affect the cost of energy or the cost of using energy. Although affordable energy is a vital component of a healthy economy, regulations frequently increase energy costs. In 1999, the Public Utility Commission of Texas adopted rules for the state’s Renewable Energy Mandate, establishing a renewable portfolio standard (RPS), a renewable-energy credit (REC) trading program, and renewable energy purchase requirements for competitive retailers. In August 2005, S.B. 20 increased the renewable-energy mandate to 5,880 megawatts by 2015 (about 5 percent of the state’s electricity demand) that includes a target of 500 megawatts of renewable energy capacity from resources other than wind. The 2005 legislation also set a target of reaching 10,000 megawatts of renewable energy capacity by 2025. Qualifying renewable energy sources include solar, wind, geothermal, hydroelectric, wave or tidal energy, biomass, or biomass-based waste products, including landfill gas. To qualify, renewable systems had to be installed after September 1999. The RPS applies to all investor-owned utilities; municipal and cooperative utilities may voluntarily elect to offer customer choice. Texas’s renewable-energy credit (REC) trading program began in July 2001 and is currently scheduled to continue through 2019. One REC represents one megawatt-hour of qualified renewable energy that is generated and metered in Texas and can be purchased to meet the renewable energy requirement. Each retailer in Texas is allocated a share of the renewable energy mandate based on that retailer’s pro rata share of statewide retail energy sales. A REC account is maintained for program participants to track the production, sale, transfer, purchase, and retirement of REC, which can be banked for three years. Texas was the first state to establish an Energy Efficiency Resource Standard in the United States. Originally, the goal called for investor owned utilities to meet 10 percent of their annual growth in electricity demand through energy efficiency. The legislature updated those standards in 2008 (HB3693) and SB1125 (2011) amended those goals again. The reductions for electric peak demand are: 20 percent reduction in annual growth in demand in 2010 and 2011; 25 percent reduction in annual growth in demand in 2012; and 30 percent reduction in annual growth in demand in 2013 and beyond. HB 3693 of 2007 authorizes the Texas State Energy Conservation Office to adopt new editions of the International Residential Code (IRC) and International Energy Conservation Code (IECC) if they will result in improved energy efficiency and air quality. In June 2010, updates to both the commercial and residential codes were adopted. The new code for one- and two-family homes is based on the 2009 IRC which took effect on January 1, 2012. The new code for other residential, commercial, and industrial buildings is based on the 2009 IECC, which took effect April 1, 2011. For buildings other than state-owned buildings, energy codes must be adopted by local code jurisdictions to be enforceable, and is normally achieved through a vote of the city council or the local government adoption process. Texas requires state government departments to compare the cost of providing energy alternatives for new and reconstructed state government buildings and for certain construction or repair to energy systems and equipment. The economic feasibility of incorporating alternative energy for space heating and cooling, water heating, electricity, and/or interior lighting must be determined by comparing the estimated cost of providing energy using conventional design practices and energy systems with the estimated cost of providing energy using energy efficient architecture and design or alternative energy devices during the economic life of the building. Alternative energy devices must be included in the construction plans if their use is economically feasible. Alternative energy is defined to include solar, biomass, wind, and geothermal energy sources. This section of Texas law (Texas Government Code § 2166.403) was originally put in place in 1995, but it was amended in 2005 (S.B. 982) to add geothermal to the list of eligible resources. Texas does not impose state-based appliance efficiency standards. However, state-owned or leased buildings must use Energy Star appliances and equipment and vending machines with energy saving devices. State buildings, institutes of higher education, and schools must also use low wattage light bulbs. Texas allows electric utilities to “decouple” revenue from the sale of electricity but does not allow natural gas utilities to decouple revenue from the sale of natural gas. Decoupling allows utilities to increase their revenue by selling less electricity and natural gas. Texas does not require gasoline to be mixed with renewable fuels. However, the state requires four different motor gasoline blends in different parts of the state including reformulated motor gasoline blended with ethanol in the Houston and Dallas-Fort Worth metropolitan areas. Texas does not provide a cap on greenhouse gas emissions nor is it a member of a regional agreement to cap greenhouse gas emissions. Texas ranks first in the nation in total energy production, oil production, natural gas production, and electricity production. In just over 2 years, Texas has doubled its oil production, competing with major oil producing countries around the world, bringing new jobs to the state, and adding to the state’s revenues. It is expected to continue to increase its oil production through existing and new shale oil formations. 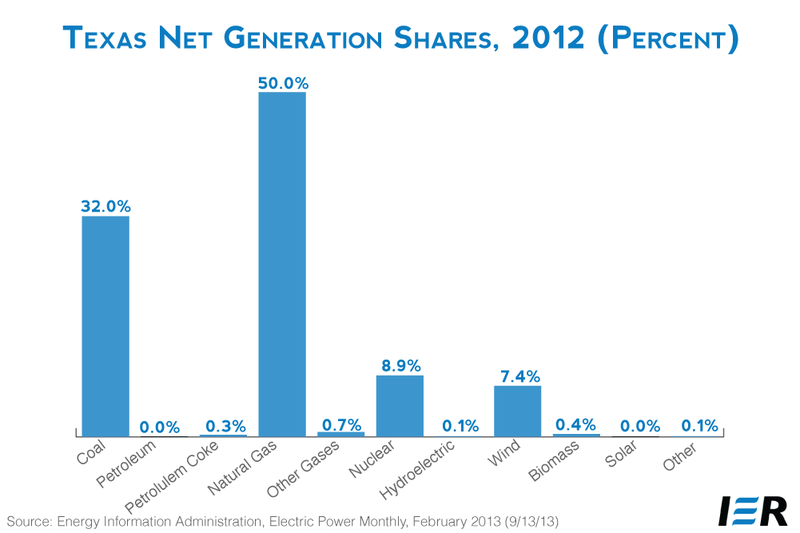 Coal and natural gas generate over 80 percent of the state’s electricity. Texas has the largest wind capacity in the nation, which generates about 7 percent of the state’s electricity. Its average retail electricity price is moderate and below the national average. While the state has a renewable portfolio standard, requiring qualified renewable energy sources to meet a capacity requirement, that requirement has already been exceeded.